A positive attitude on race day is an important thing to have. You may have doubts sometimes before the gun goes off, but you need to force them out and overcome them. That was what I needed to keep telling myself before this year’s North Shore Triathlon. It was my second time participating in this tri. I love the course and everything about the race is right up my alley, but the effort you put in on race day is all on you and your will. Leading up to race day, I didn’t feel like I had properly prepared for the race. I got in my training, but felt like I could have done more. I hadn’t raced in over a month – which is an eternity for me – so it was tough for me to get into that race mode this time around. All of that along with a couple of nights of less sleep than I would have liked, I was preparing myself for a not-so-great day where my goal was merely to get through it. With transition closing at 6:30 a.m., I got to Wilmette before 5:30. It is a bit of a walk from the parking areas to the race site and I wanted to make sure I got a good warm-up in beforehand. When I took my bike out of my car, I noticed my brake was rubbing against my wheel a little bit – great – and, in my mind, I was going through all the different things I would have to do in the course if something went wrong. Again, playing mental games with myself. I set up my transition area and watched everyone else come in. I wanted to see what the water temp was so I walked over to the beach to stick my hand in the water. The good news was that the water temp was perfect. The bad news was that, in the moonlight, I misjudged how far in the waves were coming and took a big step right into the water, leaving my one sock and shoe wet, forcing me to tiptoe through the sand to avoid having a sand covered shoe. (I really hate sand.) These were not my racing shoes, so no big deal, but I decided at that time that I just needed to stretch and go warm up. After my warm-up run, I felt a little better and more in race mode. When I returned, I learned that Fit 2 Ride Velo Studio had a tent set up for quick bike repairs, so I ran by bike over real quick to have them check out my brakes. It needed a tiny adjustment, but was pretty much fine, and I was good to go. The day was getting a little bit better. The swim set-up is wonderful and would be especially good for first-timers or people who are not used to swimming in the lake. 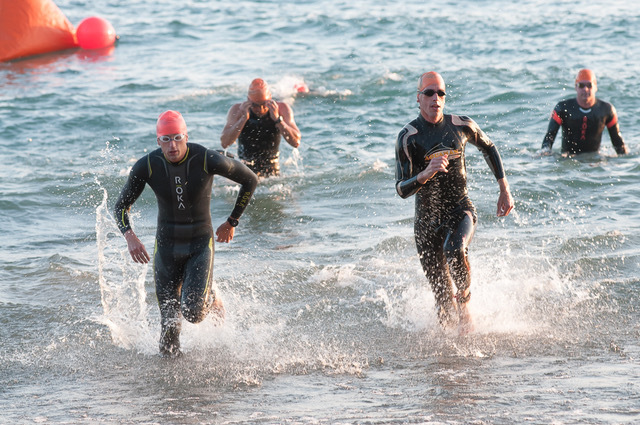 The swim runs parallel to the beach, just a few meters out, so along with the buoys in the water, you are able to sight the beach itself to help guide you to the finish. The sprint distance swim is 500 meters and you don’t make a turn until right at the end. The water temps were perfect, though it was a bit choppy out there. My wave was small enough where I never felt like I got punched or kicked by anyone else – truly a first. The bike course goes from Gillson Park, up Sheridan Road, past New Trier High School, and then back. It is a 20k, double loop course. * I was in the second wave, so it was very nice to have wide open streets for the first loop of the course, but as someone who isn’t the strongest cyclist out there, I rode most of it myself without a lot of people around to try to catch or hang with. (It also was not helping that I suddenly started singing “Bad Day” by Daniel Powter to myself.) I love the double loop set up, though, as it helps to figure out how long each section will take to complete, allowing me to try to push a little more as the race goes on. 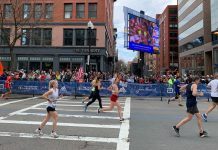 * Maybe it was because I had done the race once before and I didn’t have to look at the details too in-depth beforehand, but I had three- yes, THREE- people ask me WHILE WE WERE BIKING if it was a double loop course. Am I the only person that scours over every detail of the race website before race day, especially for a triathlon? Finally, I was off the bike and on to my favorite part, the run. The run course is kind of Y-shaped with a short out-and-back to the Bahai Temple and then a lollipop section through some residential streets. The run course is pretty fast and has some long straightaways to help you open your stride up. There are two brick-paved sections that are can be a little tough on wobbly, post-bike legs, but that is part of the fun of the course. The final 200 meters puts you back into the park and you never really see the finish line until you get there, so you just have to gut it out for the last little bit. At the end of the day, I ended up with a very solid race and, for the most part, was happy with my time. A lot of times, especially for tris and especially in the summer, you can only base your race on the effort you put in, and I was very pleased with what I had done that day. The North Shore Triathlon has grown in popularity over the past couple years and 2018’s race was the biggest one yet. 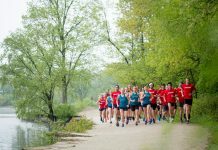 This is due to the tireless efforts of Precision Multisport – the race organizers – and their desire to put on a competitive, quality event that the community can be proud of. 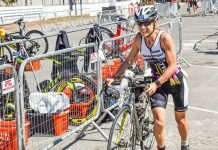 It is a great, late season race for anyone that wants to put their summer fitness level to good use and get in their last triathlon of the year.